If you’re looking for a quick answer to the types of Pancake and Waffle Maker combo appliances on the market, check out the table below. 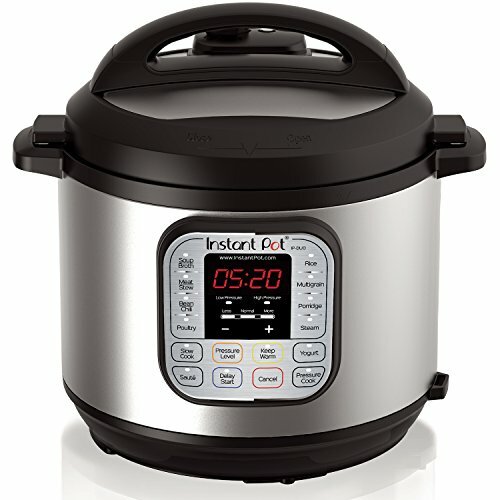 For a more detailed review of each of these appliances, please keep reading! What’s a Pancake and Waffle Maker Combo? Do you want fluffy pancakes or chewy waffles for breakfast tomorrow? Never choose one or the other again! At Easy Kitchen Appliances, we love multi-functional appliances. The more an appliance can do, the better. In this article, we’re looking at Pancake and Waffle Maker Combos. A Pancake and Waffle Maker Combo is a kitchen appliance that can excel in making both Pancakes and Waffles. Many of the appliances that can take on both of these jobs are appliances that can also do other jobs, like burgers, sandwiches, eggs, and bacon. In the end, a griddle is a griddle, no matter what you decide to cook on it. Why would you want a Pancake and Waffle combination appliance? Do you need a pancake and waffle making machine? I don’t think any of us truly needs one, but who doesn’t love to have pancakes and waffles on a Saturday or Sunday morning? Why choose to only have one or the other if you have an appliance that can easily do both. 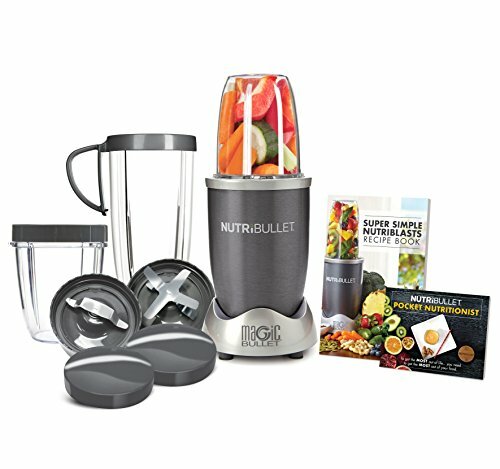 How would you like to have the ultimate breakfast machine? Image a machine that can handle all of your breakfast needs, not just waffles and pancakes but also eggs and bacon. How about burgers? These combination appliances can be used to make pretty much anything that you can think of. Are you creative? Think of all the desserts you can make with your combination pancake/waffle maker. Nutella, strawberries, ice cream, the possibilities are endless. In addition to getting creative with a multi-functional appliance, you also save room. 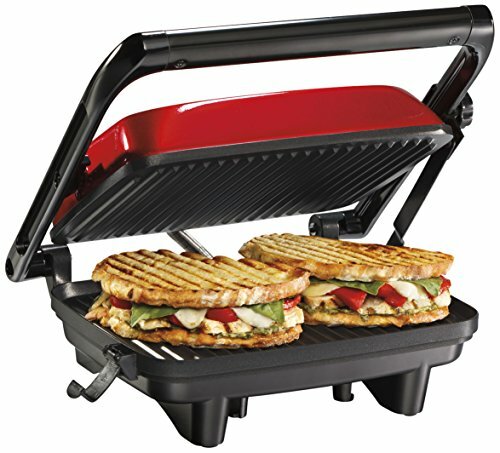 Why have a George Foreman grill, a waffle maker, a panini maker, and also use a pan on the stove top when you can have one appliance for all your needs? Makes sense to me. I’m always an advocate of saving precious kitchen counter space (and money!). The benefits of multi-functional kitchen appliances speak for themselves, don’t they? However, there are also cons of having these combination appliances. Most of the time, the more multi-functional an appliance is, the more money it is. This isn’t always the case, but it usually is. You can find a great waffle maker for under $30. Now, if you want a great waffle maker that also presses sandwiches, that’ll be a little bit more money. The more an appliances does, the more complicated it will be. There’s no way around that! You can make pancakes on your stove top and it’s a pretty straightforward process. However, if you want to make pancakes in an appliance that also makes waffles and grills burgers, it’ll be a little bit more complicated. And if you want to make pancakes while making eggs, that will be even more complicated! This is just reality. A high quality waffle maker will make great waffles. A waffle maker that also does 10 other things, will probably make pretty good waffles instead of great ones. For most of us, we’re perfectly fine with that. However, if you’re a die hard waffle fan, you’ll want to have great waffles every time! So where’s the pancake/waffle maker combo? Below you’ll see a chart with the appliances we’re reviewing, and then below the chart, you’ll see a more thorough explanation of each appliance. This Cuisinart combo Belgian Waffle and Pancake maker rules pancakes and waffles! It’s best feature is its ability to make Belgian waffles. 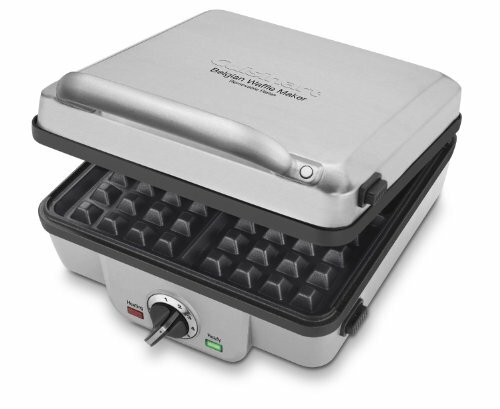 Most other waffle/pancake combination appliances make Classic or regular waffles. What’s the difference? The difference is that Belgian waffles are the thick kind and classic or regular waffles are thin kind. Belgian waffles are crunchy on the outside and chewy on the inside. If you’re looking for a multi-functional Belgian waffle and pancake combo appliance, the Cuisinart is the one is for you! This Black and Decker 3 in 1 Waffle Maker is a beast of a machine. It can do pretty much anything you can think of. It boasts 3.5 out of 5 stars on Amazon on over 2,600 reviews. What sets it apart from the rest is it’s innovative drainage feature. Overfilling a waffle maker is a common problem. When you overfill your waffle iron, it starts to back up and then excess batter oozes out of the sides, thereby making a mess on your kitchen counter. The same happens when you cook pancakes, eggs, bacon, or anything else on a griddle. This Black+Decker appliance ensures that you’ll never mess up your countertops again! You can’t ever go wrong with the George Foreman appliance. Not only does George Foreman excel in making grills, but his waffles are pretty awesome, too! The best part about this appliance is all the plates it brings. The possibilities are truly endless not only with its features, but with all the other attachments and extras that are available to buy on Amazon. 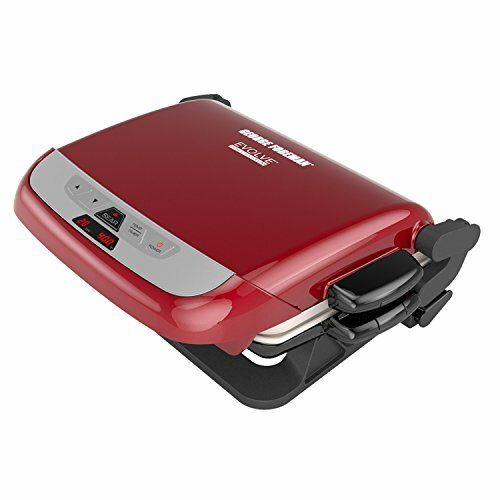 This George Foreman is the ultimate Waffle and Pancake maker AND the ultimate Waffle and Panini maker! We love George Foreman products and are fans of his brand. You just can’t go wrong with any of these pancake and waffle maker combo appliances. They’re all high quality machines capable of giving you years of breakfast making fun for really affordable prices. None of these appliances’ cost was out of control. Just the opposite, all of their prices on Amazon are really reasonable and absolutely worth it. 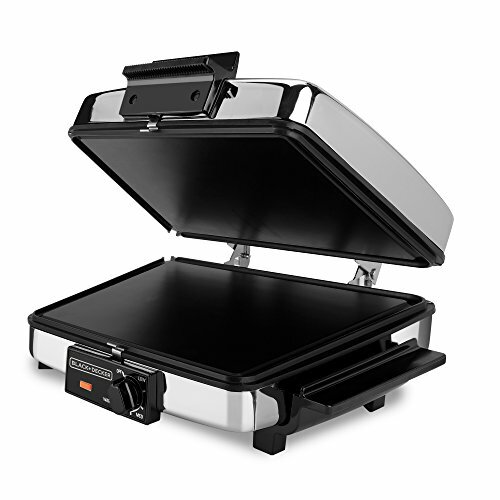 In the end, we would have to say that the George Foreman GRP4842RB Multi-Plate Evolve Grill is the winner. Not only does it make great waffles and pancakes, but it comes with enough plates and features to take care of all of your cooking needs. The George Foreman brand isn’t going anywhere, on the contrary, it’s only getting stronger. Also, the Evolve sub-brand is building out more and more innovative plates and features on it’s products. You can even buy omelet plates for your evolve grill! What do you think of our choice? Flip Waffle Maker vs Standard Waffle Maker – Which is better? Really interesting. I never knew that there were combo pancake and waffle appliances. I have one of the original style Foreman grills and I love it. Great choice with the Evolve grill! I have the Foreman grill and love it.